There is an absolute irony in materialism. When we focus our efforts on acquiring material possessions, it is with the intention of making ourselves happier, but instead we are feeding an obstacle to happiness. Cathedral Falls in Gauley Bride, West Virginia (thanks Tina and Bethany for reminding me where I took this picture). Acquiring material possessions merely suspends dissatisfaction. This dissatisfaction is perpetuated by a culture of advertising that is designed to convince us that we are not happy and need to purchase something that will make us happy. If you examine most any advertisement on television, radio, newspaper, billboard, etc., you will recognize that most are designed to point out a perceived deficiency or urgent problem and position a product as a solution. The most important thing to recognize is that your material possessions will never bring you happiness. No matter what or how much you have, there will always be more that seems to be needed. In fact, the more “stuff” you have, the more you will need to maintain and the more you will have to buy to maintain what you already have. It’s a self-perpetuating cycle. The larger and more extravagant the vehicle you drive, the more gas it will use. The larger the house you own, the more stuff you will have to acquire to fill it up. These material concerns tend to divert our time and energy away from personal development, relationships and spirituality. These are elements that make up a satisfying life. Do We Have to Get Rid of Our Stuff to Be Happy? Human Beings have created some amazing products. Technology continues to advance at a staggering pace. The products that are available to us today are extraordinary. Enjoying and celebrating these things can be inspiring and does not equal materialism. We do not have to deprive ourselves the enjoyment of material items to eliminate materialism from our lives, but rather the way we look at them. Materialism is founded in a belief that it is impossible to be happy or content without the ownership of some item. And some item is always something that we don’t currently own. So, materialism requires suspending happiness and living in discontentment until some future date. This works against the principles of an inspired life including gratitude and focusing on the moment. In the not too distant past, I had a habit of focusing my time, energy and money on home improvements, repairs and landscaping projects. So convinced was I that these projects needed to be done that I would use any free time I had working on these projects, buying things I needed or planning the next project. When I was not working on them, I was thinking about them. I could not enjoy spending time in my yard or home without thinking about what needed to change around me. Early this year, I made a decision to enjoy my life and be grateful for the things that I have. It is amazing what tremendous power a simple decision to enjoy life has. When I set goals or find myself stressed out, I remind myself of this decision and it changes my perspective. Consequently, I have spent a lot more time this summer sharing and enjoying my yard with family and friends and much less time working and worrying about it. My house has not fallen apart. My yard has not been reduced to weeds and mud. And, the projects I had started did not cease to progress. Yet, I still found time to enjoy my life and the material possessions I already own. Imagine what your life would be like if your ability to improve or add to your material world were taken from you. Your home and car would stay in their current state, including whatever defects they currently have. Could you find a way to satisfaction in this scenario? Make a decision today that you want to enjoy life. Consciously, consider this decision when you find yourself wanting to change the material world around you. Ask yourself if the way your thinking about your object of dissatisfaction is supporting your decision to enjoy life. This is so true! Great perspective on it too! Thanks for the inspirational message. 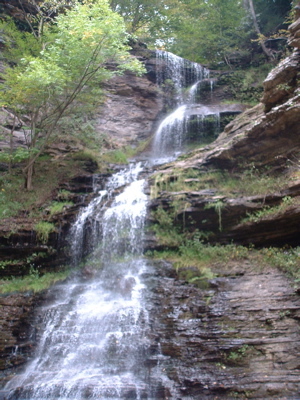 Also – the photo “waterfall somewhere in WV” is called Cathederal Falls and located in FAyette County, WV. Thanks Bethany! I updated the caption.